Question: Why should I be concerned about maintainng/repairing my chimney? Release dangerous, toxic, and unhealthy gases into your building. Allow flames and sparks to escape and come in contact with potentially combustible materials in your building. It is a real fire hazard. Allow loose masonry materials to fall and potentially cause damage to property or people. Several of these dangers often work simultaneously. The best way to identify the dangers of chimney problems is to call on the expertise of an experienced and trained professional who has a keen understanding of masonry materials science. Only after causes and effects have been determined can the most appropriate and enduring intervention method be recommended. Contact us in this regard. Question: Why are chimneys so prone to deteriorate? Answer: Unlike masonry walls, chimneys are exposed to the effects of wind, snow, ice, and rain from five surfaces – the four sides of the chimney and the top. They are therefore subject to a continuous war of expansion and contraction due to the chimney masonry being heated by hot gases from the fire, and the cold, wet outdoor temperatures. This repetitive expansion and contraction creates a lot of movement, and consequently deterioration. Question: What are the main things I can do to prevent my chimney from deteriorating? Answer: Make sure your chimney crown (the “roof” of your chimney) is constructed of the correct materials and is designed to function correctly. If it is cracked or deteriorated, make sure the correct decision is made to repair it or remove and replace it with a new crown. If the mortar joints in your firebox or on your chimney need repairing (repointing), it is critical that the correct mortar mix is used. This mix should be designed designed and customized by a licensed, insured, knowledgeable, and experienced chimney mason. Most chimneys require a specific custom mortar mix that works in cooperation with the masonry units. (See Mortar Repair.) This will assure you that all masonry materials used are compatible with each other, and look good, too. Have your chimney inspected periodically by a licensed, insured, knowledgeable, and experienced chimney mason. Small problems fixed early will save a lot of money in the future. 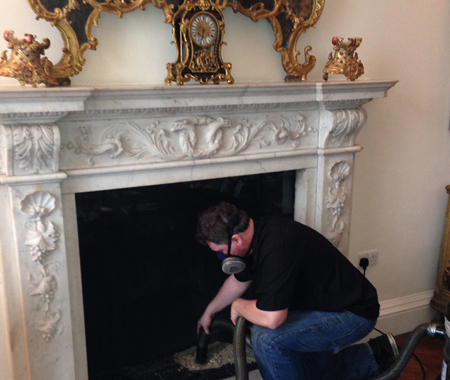 Once a chimney begins to deteriorate, that deterioration grows rapidly if left unrepaired. Question: My chimney(s) are very difficult to access. How can they be safely accessed in order to do the repairs? Answer: Any experienced and dedicated chimney mason should be fully equipped with a wide variety of equipment to safely access any chimney. Accessing the chimney should be done without causing damage to the roof. Typically, an aerial man lift (cherry picker), specialty scaffolding, or custom-made roof brackets are used. Question: Who should repair my chimney or firebox? Because of the issues detailed above, your best option is always an expert chimney mason if you want your chimney to be repaired correctly. Handymen and chimney sweeps are very good at handyman work and cleaning the insides of chimneys, but are usually not licensed, experienced masons. Neither do they work with masonry materials day in and day out. Just as you should not have an expert chimney mason sweep the inside of your chimney, neither should you have a chimney sweep or handyman repair your chimney. Question: What if my chimney is leaning? Chimney problems are too important to leave to a novice. Bloor Chimney Sweepers are a well-qualified, experienced, and ready to take care of your chimney problems. Contact us to do the job right.